Evangelicalism, the Protestant Christian movement, began in England in the 1730’s. By the Regency, Evangelicals had become a major voice for reform as well as proponents of philanthropy. Religious enthusiasm was not well thought of in Society at this time and Evangelicals in the upper classes were sometimes ridiculed or treated with contempt, yet still they persisted in trying to change the wrongs they perceived in society. William Wilberforce worked for years and was finally instrumental in bringing about the abolition of the slave trade. Hannah More used her writing to encourage the people of England—specifically the lower classes—to embrace sobriety, humility and industry. She also established schools to teach reading and religion to underprivileged children. Evangelicals worked tirelessly to help the needy and to promote political and prison reform. They advocated better working conditions for chimney sweeps and textile workers and the elimination of rotten boroughs. Many Evangelicals were very disapproving of Society, viewing it as rife with moral decay and frowning on their usual past times such as music and dancing. 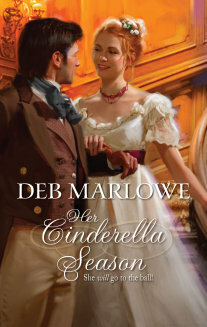 Lily Beecham, the heroine in my new release, Her Cinderella Season, was born a gentleman’s daughter, but spent the last seven years in an Evangelical household. She faces the difficulty of blending her two worlds, finds herself mixed up in the excitement of helping the scholarly Jack Alden track down a villain, and takes on the greatest challenge of all—winning the elusive Mr. Alden’s heart.